This is the third in a series of posts about the current appearance of this blog. The first post explains why I’m blogging here at WordPress.com, and using the Simpla theme. The second post explains the custom CSS I use. This post is about the sidebar widgets I use. For example, there’s the popular Categories widget, which does what you’d expect: lists the categories in use at the blog. Most of the widgets I use are what I would call “HTML widgets,” but which go by the official name of text widgets. Such a widget gives me a box into which I can type heading text, and a box into which I can type HTML. At the top of the sidebar is a widget with the heading “My Identity” and HTML including an image from, and a link to, claimID. Rather than having lots of About and Profile pages for the multiple blogging and other web services I use, I want to have one main place, and claimID currently seems to me to be as good a host as any for that. I find it strange to call things like this “text widgets” because, apart from the heading, there is no text in this particular widget. Right under the categories widget is… another text/HTML widget. Under that comes the Search widget. This blog is part of a family of blogs, and it probably makes sense to direct most search at the family rather than only at the currently active member. I’ve used Google to create a custom search engine to do just such a search. Right under the text widget linking to the custom search is the Search widget, which provides search of the current blog. The widget with the heading Subscribe and the feed symbol is another text widget. No, it’s not the RSS widget. You use a text widget to put your feed in your sidebar. Yes, I too was confused at first. The Share heading and the Creative Commons license comprise the last text widget in the sidebar. 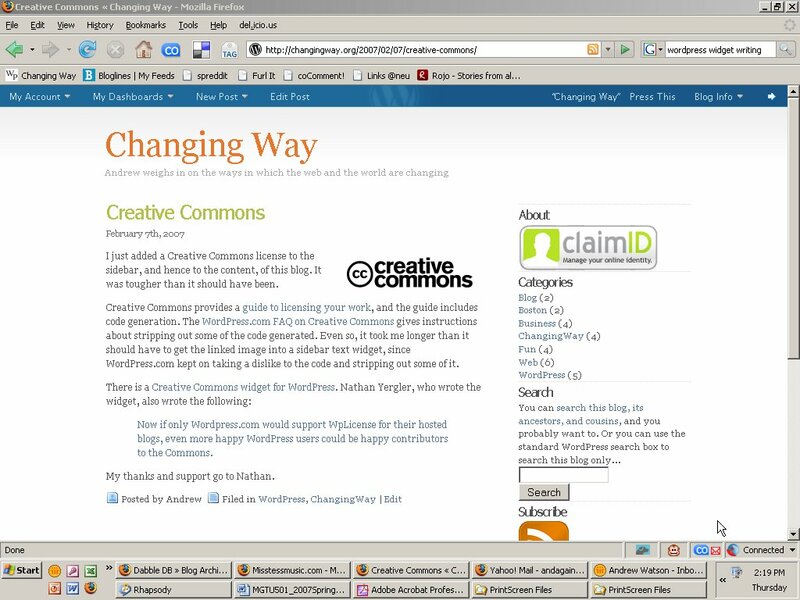 There is a Creative Commons widget, but it’s not available at WordPress.com. I wish that it was. So now we’ve reached the end of the sidebar and, for now, the end of this little series. There will probably be a fourth episode of the trilogy, especially if anyone actually reads the first three. Thank you for reading this far. How did you enable widgets with this theme? Thanks. The Simpla theme at WordPress.com is widget-ready. When I just go to Presentation and click on Sidebar Widgets. Interesting. Thanks. Unfortunately, the theme from the designer’s site isn’t (at least not the one I downloaded). Hi there. I too use the Simpla theme, and have a few of the ‘probs’ of ‘display’ that you initially did…I don’t like the larger than life ‘dates’, and the headers/type are the wrong size over the date, I’d also like to beef up my ‘header’ with size and ‘colour density’…Unfortunately, I is CSS neophyte, really have NO CLUE where/what to do…just fumble along with rich text, and/or drop in Word text, doing massive labour intensive re-edit when it ‘slips’…. Is there a ‘simple way’ to get into the HEADER and TITLE sections to modify to my liking? Hmmm? Pls & Thy. Could you share your Widgetized version of Simpla? Spot, I didn’t make Simpla widget-ready. WordPress.com did. As for the particular widgets I use, I tried to explain that in the post itself. Are your heading images? Search, Share, Subscribe, and so on? If so, how did you get them there? I am looking to replace all of my sidebar / widget heading titles with cuter images of the same type of font that is in the header image. I have been searching and hunting for directions on how to do this. I am a few days short of paying someone to do it for me and can’t figure out where in the css file or sidebar.php file I need to be looking? Any suggestions or advice would be greatly appreciated. It seems that I want to do exactly what you have done to your sidebar widget titles. If you look at my blog, you can see that I have text widgets with the cute image headings, I can’t figure out how to get image headings for the others – archives, recent posts, etc. The Simpla theme as provided for self-hosted blogs, such as yours, is rather different from the version provided at WordPress.com. My headings are not images, just text styled with CSS.